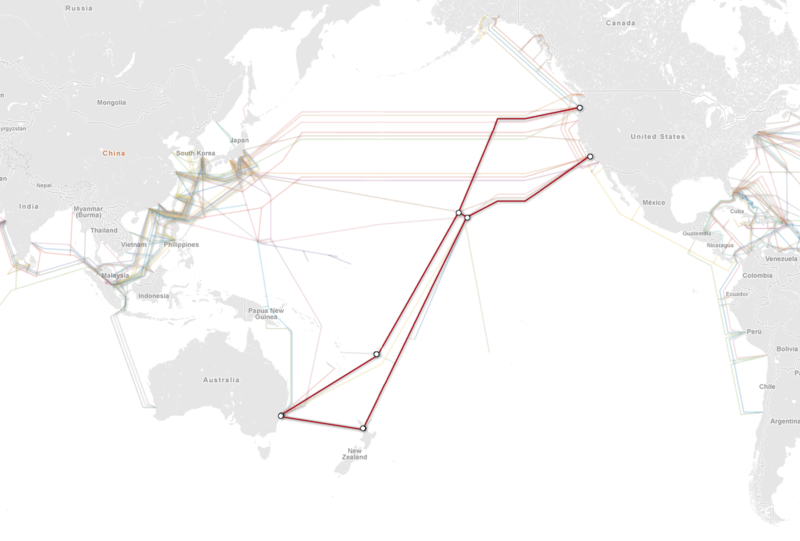 Transit on the Southern Cross Cable, active since 2000, has historically been very expensive – up to eight times the cost of transit on similar length cables across the Pacific between the US and Japan. In early years, only Telecom (via their transit company Global Gateway), TelstraClear (via their transit company Telstra International, nee Reach), and Asia Netcom (now known as Pacnet) purchased capacity directly from Southern Cross. Since then, Vocus and Kordia (via their transit company Odyssey) have joined the market. Pacnet and Vocus are very different from Telecom and TelstraClear, in that neither is an Internet Service Provider in New Zealand. Kordia, with their new carrier Odyssey, is acting along the same lines as Telecom and TelstraClear in that through Orcon they are selling directly to end users. There’s one exception where Kordia is concerned – their ISP Orcon “peers” at the Auckland Peering Exchange. Peering is the practice of linking networks together for exchanging traffic. Several neutral (not owned by an ISP or transit provider) peering points exist within New Zealand. At these locations, networks pay for a connection to the exchange, and exchange traffic freely. Around thirty Internet Service Providers and a number of other content providers and private networks peer at the Auckland Peering Exchange. Traffic on an ISP network that cannot reach its destination via peering must be sent through an upstream carrier. In New Zealand, that means handing it off to one of the five customers of Southern Cross Cable mentioned above. These carriers typically charge a flat rate for traffic sent through them – whether the traffic is destined for a network in New Zealand, Australia, or Spain. Unless special arrangements are made, it’s all priced at “international” rates, which are huge multiples of what ISPs pay in every other country in the OECD. Very few large New Zealand ISPs do not peer at the Auckland Peering Exchange. Among those are TelstraClear and Telecom – both of whom happen to also sell international transit. Telecom offers some limited peering – for parties that bring cables to their exchanges, but their peering notably excludes a huge number of traffic classes including traffic destined for schools. The end result of Telecom and Telstra’s refusal to peer at neutral exchanges is more money for their transit businesses. They are, and have been for many years, taking advantage of their scale as both wholesale and retail providers to keep smaller providers small. The following image shows a snapshot of peering and transit arrangements in New Zealand. It is not intended to be complete and could contain multiple inaccuracies. Information on peering was extracted programmatically from sources including the Auckland Peering Exchange and the Hurricane Electric BGP database. 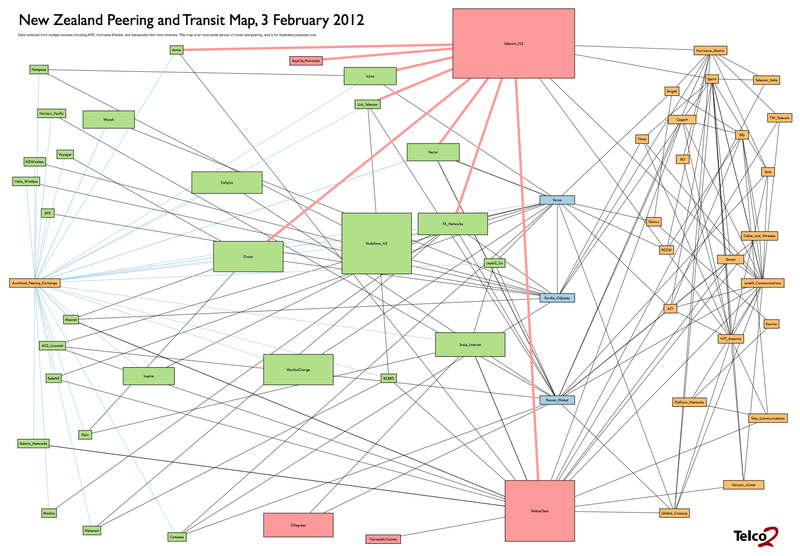 Non-peered transit arrangements between some providers shown as red lines are assumed based on traceroutes collected from a number of end networks. Actual details of these arrangements (beyond the fact that they are not freely peered at a neutral peering point) are commercially sensitive, and unavailable for publication. The snapshot data was collected on the 3rd of February 2012, and is valid only for that day. Green networks are peered at the APE, and are connected to it with blue lines. Transit providers (who are not also retailers) present in New Zealand are shown in blue. Overseas transit providers are shown in orange. Paid transit with Telecom NZ is shown in thick red lines. Click to download an A1 sized PDF (45KB). Do you think that trans-Pacific competition from the Pacific Fibre cable, when ready for service, will do enough to change the situation? To me, it seems like the arrival on the APE of a few International players with relaxed peering policies (i.e. happy to peer with the larger NZ independant ISPs), along with some cheaper international transit, could be what’s needed to disrupt the oligopoly and change the landscape? I think Pacific Fibre is going to blow the market wide open. iiNet is Australia’s second largest DSL provider, and has committed to Pacific Fibre. They briefly owned iHug, before selling it to Vodafone NZ in 2006. I would not be surprised if iiNet get back in to New Zealand the second Pacific Fibre lights up. Vodafone NZ currently uses Vocus for international connectivity. They signed a ten-year deal with Pacific Fibre that will move them up the food chain to being a retailer with their own international connectivity – on the same level as Telecom NZ and TelstraClear. These two businesses alone have the scale and ability to change the shape of broadband in New Zealand. I look forward to it!